The Kelty TN2 tent is Kelty’s answer to the star gazers prayers. The tent has a roll back fly, and full body see through mesh walls for 360 degree unobstructed views. The main draw here is obviously the roll back, stargazing top. Sure, it gives you great views of nature, but does it protect you from it? Topping off the Kelty Trail Logic System, the 3TN2 offers living space for two, with a 27.5 foot floor, two doors, and two vestibules at just 4 pounds. Price of admission is 249. You’ve gotta love that view! The TN2 offers truly unrestricted views of whatever you can manage to plant your tent in front of. With the top off, even laying down flat your views are unobstructed at all angles. Great if you really want that view. Pitching the tent is painless, thanks to color coded poles and clips. 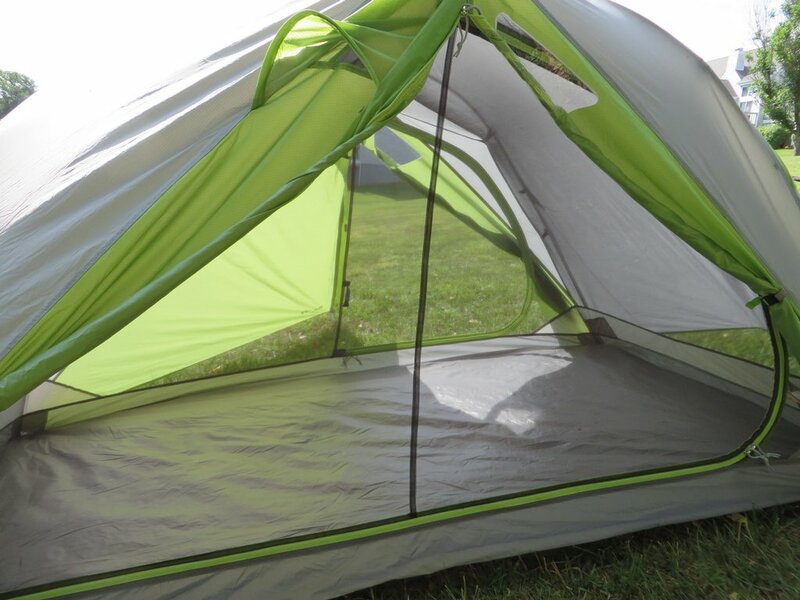 The poles connect into the tent body at the floor using a sort of ball socket which clips instantly, without having to use two hands. Just pop it directly in. The clips that connect the tent poles to the mesh walls themselves are a clever design. You lift them up to the pole, and rotate them on to clip them onto the pole. This is quick, intuitive, oddly enjoyable, and feels more secure than the standard clips on most tents. Livability is fantastic. Huge amounts of internal space, and vertical walls give plenty of room to move about inside your fortress. One large door provides for easy entry and exit, while a second adds utility. Large vestibules on both sides offer more than enough storage space. I managed to store all of my gear under one side of my vestibule, providing unobstructed entry and exit. The tent’s build quality is excellent all around. Composed of coated nylons and durable nylons, you’ll not have to baby it like many light weight tents. 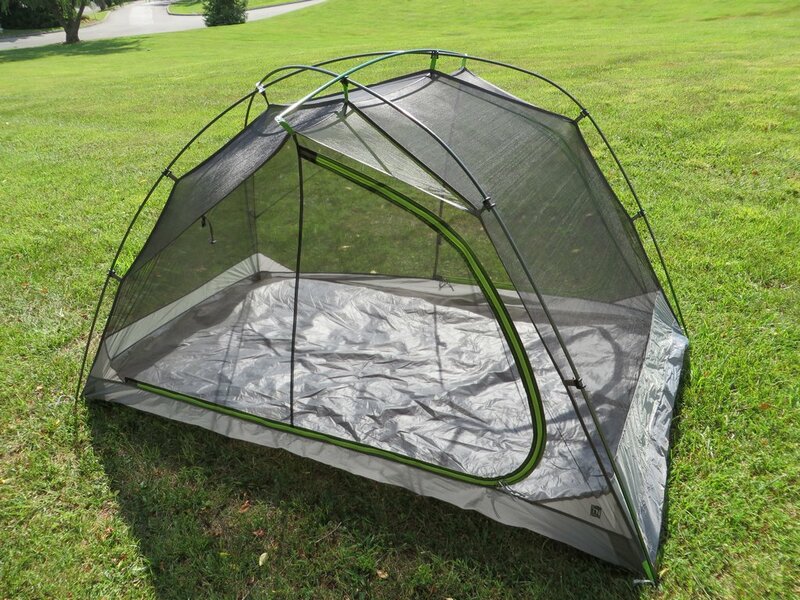 The tent’s 40D nylon floor is durable enough that packing in a foot print isn’t necessary, saving you weight there. The fly is a durable 40D ripstop nylon, with excellent waterproofing all around. The tent stakes are above average, 3 sided aluminum stakes that grip well and don’t slip. Upon pitching, the tent stands sturdy and rigid. Multiple guy-out points and lines add support for high winds. Condensation was minimal on a hot humid night in the Smokey Mountains, thanks to exquisite ventilation all around, and vents in the top of the tent. One luxuriously large door, and one small door left me puzzled. I thought, I’ll test the tent and I’ll understand why they did this. that epiphany never came. The second door, while completely usable, isn’t quite as convenient as the primary large door. Perhaps this was to save weight or cut costs, but I’d rather have a second large door over a couple ounces. The tent came with guy out lines and stakes for storms, but only enough for one side of the tent. Again, another strange decision that proved to annoy me a bit. But just a bit. It does save weight, but I’ll have to move my guy-out lines depending on where I camp, buy more lines, or choose two sides to permanently attach them, and pitch my tent accordingly. It’s no secret, I’m a fan of Kelty’s products. When I first began backpacking, my first good backpacking tent was a Kelty. Many years later, that tent still stands today. They produced fine products then, and they produce fine tents now. 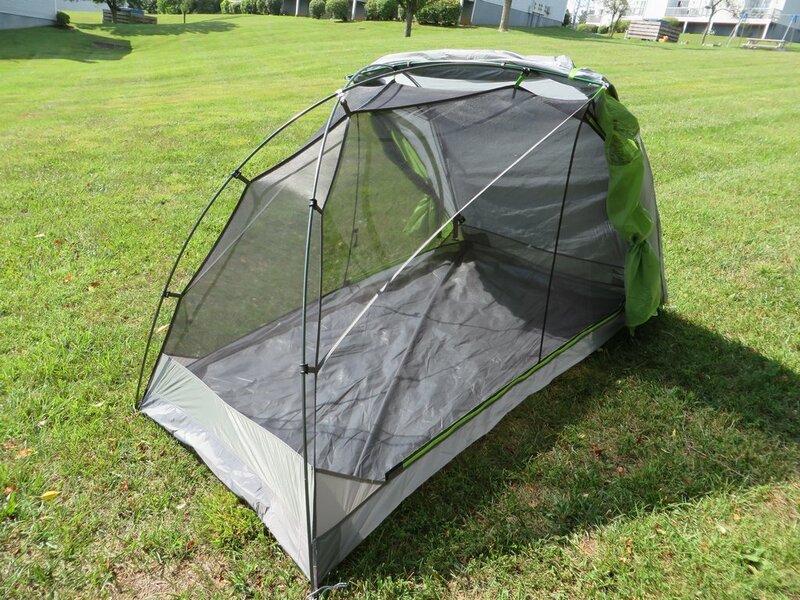 The tent is light weight, well-built, and durable. Pitching is simple, internal space is phenomenal, and the full mesh body is a joy to anyone who appreciates a great view and breezy ventilation. At 250$, it’s certainly one of the best values on the market. Despite a couple minor, head scratching, quibbles, it’s a great tent that anyone can appreciate. Great review! The roll back fly is a really cool feature, but i’d buy the three person moki by Nemo. It doesnt have quite as much viewing area, but it has sky windows and it’s four season. 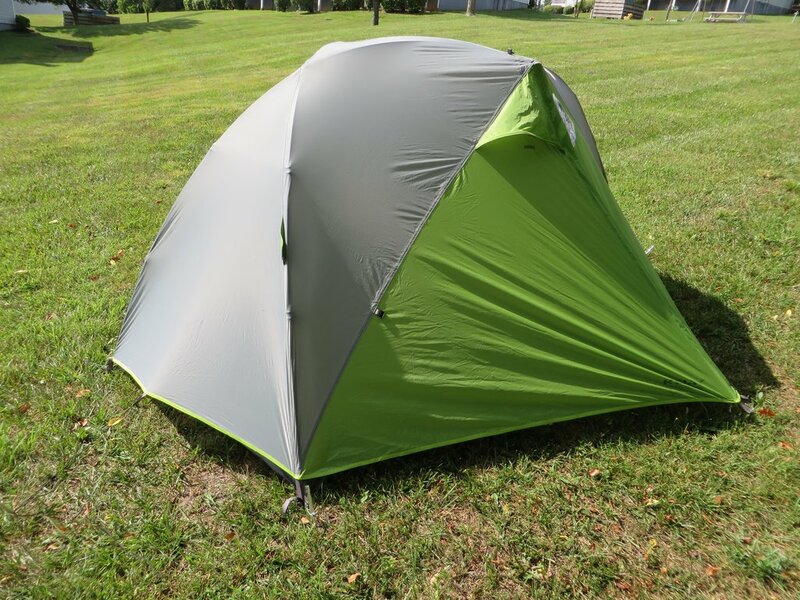 The reviewer at http://gear-guide.com/67/ really loved it, but it is a little more expensive than your tent. Check it out though. The Moki is a great tent, but they’re dramatically different tents for different purposes. The moki is more than 4 pounds and 600 dollars heavier. Great for mountaineering, but i couldn’t recommend it for backpacking. Very much apples to oranges. I need some help with a decision on a backpacking tent for my son (currently 11) and me. Kelty TN2 for $200 (on sale at Sports Authority), or REI Quarter Dome T2 for $170 (on closeout, and additional discount at REI Outlet, plus I have an additional $40 in REI cards, making my out-of-pocket spend $130)? 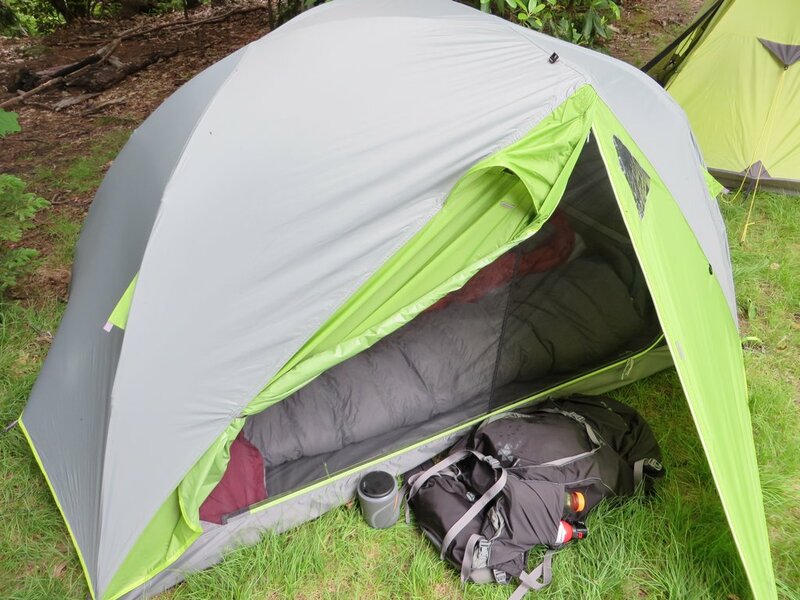 The T2 (similar in design to the Half Dome you previously reviewed) weighs about 5 ounces less, higher grade DAC poles, and about the same interior area, but has much less usable vestibule area — 6.5 sq ft on each side, as opposes to 10 on each side of the Kelty. It’s hard to ignore such a deal; the T2 originally sold for $300. Still, spending an additional $70 is not going to kill me, if the TN2 a superior tent. I have quite a bit of experience with the REI brand tents, and while I don’t have a review on my site, I can attest that it’s a fantastic tent. One of my long term favorites in fact. You’ll enjoy it very much. My honest opinion, as much as I’m enjoying the TN2 (views are great! )I would go with the T2, especially at that price. It’s an older model, but the engineering is still top class. It’s plenty roomy enough, and the ventilation is great. You won’t miss the vestibule space as much as you would think, and the construction is very solid. It also holds up great to weather. You won’t be disappointed. Oh yes. Very much so. You should be able to store a pack, boots, cookware, and more under the vestibules no problem at all. I was always able to store all of my gear under the vestibules. They’re larger than they look, and the space is used efficiently. You were a tremendous help, made my decision easy, and saved me more than a few bucks! Thanks again. I enjoy your reviews. Can the TN2 be dry pitched (fly first; then clip in body)? Thx. Hi Ken! Thanks for reading. Not that I’m aware of. They have a unique clip system that I’m not sure would work that way.